So the first two self-locating numbers in pi are 1 and 16,470. It's therefore interesting that the 1st and 16,470th verses in the Bible each have a relation to the word "wisdom". In the Jerusalem Targum (Aramaic translation of the Bible) the first verse begins "In wisdom, God created ..." The gematria value of the Bible's first verse is the product of the standard and ordinal values of the Hebrew word חכמה (chokmah, meaning "wisdom"). In the Sefer Yetzirah (Book of Creation) there are 32 paths to wisdom. Verse numbers 1 and 16,470 in the Bible each consist of 7 Hebrew words and 28 letters. When the final forms are included, the 22 letter Hebrew alphabet becomes 27 letters. The last of the 28 Hebrew letters in the Torah's first verse is the final tzaddi, the 27th letter. So the 28 letters of Gen 1:1 are 27 letters, followed by the 27th letter. The first occurrence of 294 in pi begins from position 186. The King James Version of the Holy Bible (KJV) was first published in 1611. In 2017 (5777-5778 on the Hebrew calendar), the KJV will have been in existence for 406 years. The area shaded light blue = 135. This is the 30,734th verse in the Bible (KJV). The phrase "the sword of my mouth" (τηι ρομφαιαι του στοματος μου) has a gematria value of 3511, which is the 490th prime number (see Mat 18:21-22). The Authorized King James Version of the Holy Bible (KJV) includes 12,831 distinct words. 11372 is preceded by the three digits 723. The 723rd Hebrew word in the Bible is האדם ("the man"), when God took a rib from the man, and made he a woman (Gen 2:22). In the Bible, God's Presence is described as either consisting of or surrounded by an extraordinarily bright light (see Exo 24:16-17, Eze 1:26-28; 10:4; 43:2; Psa 104:1-2). Ezekiel speaks of the brightness of the glory of the LORD. According to the prophet Isaiah, the LORD'S glory will be an everlasting light, so bright that the sun and the moon will no longer be necessary (Isa 60:19-20). This is the 13th occurrence of 888 in pi. This first occurrence of 1397 begins from position 17,160. The phrase "He is despised and rejected of men;" (נבזה וחדל אישים) has a gematria value of 473, as does the phrase "stars of heaven" (ככוכבי השמים). Isaiah said that in the day of the LORD, the stars of heaven shall not give their light and the sun shall be darkened in his going forth (Isa 13:10). This first occurrence of 780 begins from position 773. The Greek word δικαιοσυνη ("righteousness") has a gematria value of 773, which is the 137th prime number. 137 is the inverse of the fine structure constant, which is fundamentally important in the theory of how light and matter interacts. The preceding three digits are 115, the gematria value of הנני (hineni, meaning "Here I Am" or "Here Am I" or "Behold", see Gen 22:1;11; 31:11; 46:2, Exo 3:4). The Preacher compared light to wisdom (Ecc 2:13). 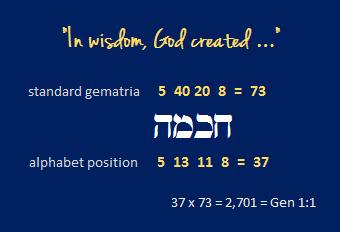 The word "wisdom" is חכמה (chokmah), and we have already seen how the product of this word's standard and ordinal values provides the gematria value of Gen 1:1. The phrase "wisdom excelleth folly, as far as light excelleth darkness." (יתרון לחכמה מן הסכלות כיתרון האור מן החשך) has a gematria value of 2701. The preceding three digits are 234. The preceding three digits are 661, which is the 11th star number. Considering 300 is 253 in the base 11 counting system, and 253 is the 7th star number, it seems appropriate to look to the stars for answers. The following three digits are 192. The first 13 verses in the Torah describe the first 3 days of creation. The Torah's first 159 words describe the first 3 days of Creation. The 3rd, 8th and 13th stars. The areas shaded lilac = 600, and black = 300. Beginning from position 900 in pi are the three digits 359. The first occurrence of 600 in pi begins from position 359. 718 begins from position 2,775. The star numbers 37, 337 and 937 are prime numbers 12, 68 and 159 respectively. 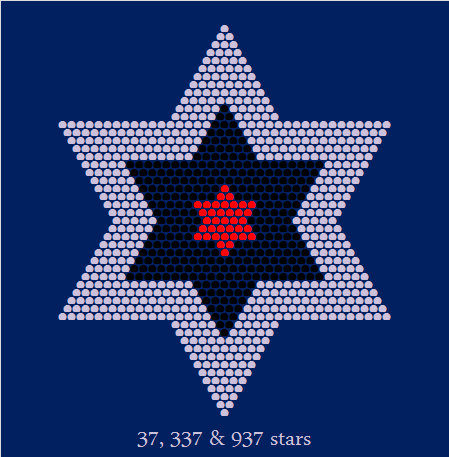 35,113 is unique among star numbers; being the product of three consecutive star numbers. 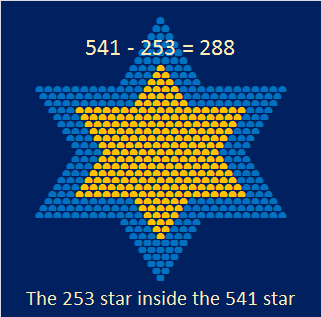 The three prime factors of 35,113 (the 77th star number). The first occurrence of 35,113 in pi begins from position 31,661. Biblical heroine Esther has a name which comes from the Persian meaning "star". 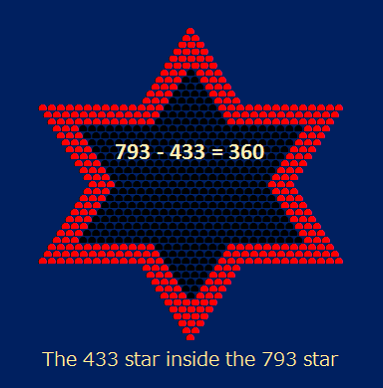 Esther (אסתר) Strongs H635 has a gematria value of 661, the 11th star and 121st prime number. 121 is 11² and also a star number. The 5th star inside the 11th star. The area shaded red = 540. The Book of Esther contains one of the most chillingly accurate prophecies in the Bible (see here). Esther's plea to the king that the ten sons of Haman be hanged from the gallows was puzzling, considering the ten sons of Haman were already dead. The puzzle would not be solved until the Nuremberg executions following the war crime trials of 1945-46. Beginning from position 148 in pi are the five digits 12848, the verse number of Est 9:13. 35,113 is the product of the first three prime stars (13, 37 and 73) which are the 6th, 12th and 21st prime numbers. In Hebrew, אחד (echad, meaning "one") has a gematria value of 13, which is the 6th prime number. The term "one God" appears 6 times in the Greek New Testament. The letters א (aleph) and ת (tav) are the first and last letters of the Hebrew alphabet. The word את (Aleph Tav) Strongs H853 is generally untranslated, and used to point out more definitely the object of a verb or preposition. את appears more often in the Tanakh than any other word, second being יהוה (YHWH). The first appearance of את is the 4th word in the Hebrew Bible. When God made the lights to divide the day from the night (Gen 1:14), the word להבדיל (laha'badal, meaning "to divide") is the 166th word in the Hebrew Bible. 13 is the gematria value of אחד (echad, meaning "one"). The term "one God" appears only once in the KJV Old Testament (Mal 2:10). In this verse, one God is אל (El) Strongs H410. The following two digits are 26, the gematria value of יהוה (YHWH) and then 613, which according to Jewish tradition is the number of commandments in the Torah. There was also a 42-letter name of God used in the Temple, which the Rambam (The Guide for The Perplexed) tells us was a phrase of several words totaling 42 letters. Collectively, these words expressed an idea of God’s essence. The first occurrence of 42 in pi is preceded by the three digits 253, the 7th star number. 253 - 181 = 72. There are 72 names of God in the Shemhamphorasch. The 312nd word in the Bible is האדמה (haAdamah, meaning "the earth") when God made everything that creepeth upon the earth (Gen 1:25). The 131st and 181st words in the Torah are the same word: על, meaning "upon", and in both cases is used as a part of a hyphenated phrase על-הארץ ("upon the earth"). The 181st word appears in Gen 1:15, when God (Elohim) said, Let the lights in the firmament give light upon the earth. In total, the phrase על-הארץ ("upon the earth") appears in 86 verses in the Tanakh. The Apostle John said there are three that bear record in heaven (1 Jo 5:7), and for this the stars align. The first occurrence of 159 in pi is followed by the two digits 26, which is the gematria value of יהוה (YHWH). The 26th verse in the Bible begins "And God said, Let us make man..." (ויאמר אלהים נעשה אדם) which also has a gematria value of 813. The light created in Gen 1:1 was a primordial light. This primordial light was hidden from man after the deception of the serpent, and according to a Midrash (b. Hag. 12a) has been hidden away for the benefit of the righteous in the world to come. In the Genesis pi verse, God said to the serpent, Because thou hast done this, thou art cursed (Gen 3:14). The word בן ("son") appears 1635 times in the Tanakh. The first occurrence of 1635 in pi is preceded by 961, which is the gematria value of "two hundred threescore and sixteen" (διακοσιαι εβδομηκονταεξ), the number of souls saved from the shipwreck in Act 27:37. In Hebrew, "son" can also be spelled בנו (benu) in which form it appears 282 times in the Tanakh. The first occurrence of 282 in pi begins from position 112. The 112th triangle is the combined gematria values of Gen 1:1 and John 1:1. In John's Revelation, we read concerning the return of Christ: "Behold, he cometh with clouds; and every eye shall see him," (Rev 1:7, also see Dan 7:13). The phrase "Behold, he cometh with clouds" (ιδου ερχεται μετα των νεφελων) has a gematria value of 4441. The first occurrence of 603 in pi begins from position 263. When God said, Let us make man (Gen 1:26) the man (אדם) has a gematria value of 45. The 603rd Hebrew word in the Bible is the third word in the 45th verse. That word is השלישי (haSheliyshiy, meaning "the third"). the word "third" appears in 159 Bible verses (KJV). The first appearance of the word "seventy" is in Gen 4:24. This is the first verse since Gen 1:1 that has 7 Hebrew words and 28 letters. In this verse, the word εβδομηκοντακις (hebdomēkontakis, meaning "seventy times") is Strongs G1441. There is a Jewish legend which states that were it not for 36 just men in each generation, the world would cease to exist. These thirty-six righteous (tzaddik) are known collectively as the Lamed-vavnik, after the Hebrew words lamed and vav (thirty and six). The legend is presumed to have been taken from Isa 30:18 which addresses God's justice and grace at the end of days. This verse ends "blessed are all they that wait for him" where the word "him" is lamed vav (לו) which has a gematria value of 36. The gematria value of משיח (Moshiach) is 358, and beginning from position 358 in pi are the two digits 36. The preceding four digits are 2590, the gematria value εκατον πεντηκοντατριων ("an hundred and fifty and three"), the number of fish caught in the net (Joh 21:11). The psalmist is also waiting for him, when he meditates: "And now, Lord, what wait I for?" (ועתה מה קויתי אדני) which has a gematria value of 1117 (Psa 39:7). The first occurrence of 1117 in pi begins from position 153. The first 36 verses in the Bible have a total of 503 Hebrew words. When God said אהיה אשר אהיה ("I AM THAT I AM") in answer to Moses' question (Exo 3:14), the gematria values of these three words are 21 501 21. The middle word אשר (asher) has the same spelling, but a different meaning to the word אשר (esher, meaning "blessed"). The word אשר (asher, esher) has a gematria value of 501. The first occurrence of 501 in pi is followed by the three digits 935. The first occurrence of 1142 in pi is followed by those same three digits 935. The phrase אהיה אשר אהיה ("I AM THAT I AM") has a gematria value of 543. The following three digits are 266. The 543rd word in the Bible is אלהים (Elohim) when the LORD God made every tree in the garden, including the tree of life (Gen 2:9). The term "the tree of life" (ועץ החיים) has a gematria value of 239, the 52nd prime number. Jesus said, I am the light of the world (Joh 8:12). On the first day of Creation, God created light, and separated the light from the darkness. The first day of Creation is described in Gen 1:1-5. The first occurrence of 641 (Blessed are all they who wait for him) in pi begins from position 1,423 in pi. Again we turn our gaze to the stars of the heaven. The 37th word in the Bible is האור ("the light") when God separated the light from the darkness (Gen 1:4). 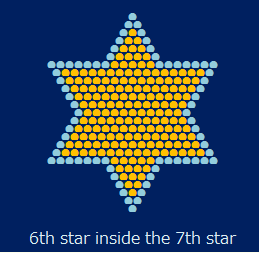 The unity star inside the 37 star. The 37th word in the Bible is האור ("the light") when God separated the light from the darkness (Gen 1:4). The area shaded red = 36. Peradventure there be thirty and six righteous? The 36th prime number is 151. The 151st word in the Bible is אלהים (Elohim) when God saw that it was good (Gen 1:12). The first occurrence of 151 in pi begins from 393, whilst its first occurrence in phi (the golden ration) begins from position 939. 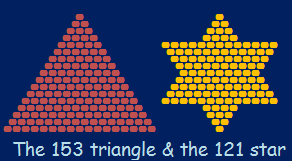 The 153 triangle (see Joh 21:11) and 121 star are each 17 rows deep, with a perimeter of 48. 153 - 121 = 32 (paths to wisdom). The first three occurrences of 32 in pi begin from positions 15, 27 and 111. The legend of the lamed-vavnik may have been inspired by Abraham's intercession on behalf of the righteous within the condemned cities Sodom and Gomorrah. Abraham's opening plea "Peradventure there be fifty righteous (אולי יש חמשים צדיקם) has a gematria value of 999 (Gen 18:24). The first 999 in pi is followed by 999. Abraham subsequently upped the ante by reducing the required number of righteous to ten (Gen 18:32). Those ten couldn't be found, and Sodom and Gomorrah were both destroyed. But the precedent for the Tzaddikim had been established. The product of the first three prime star numbers is 35,113, which is the 77th star number. The 36th prime number is 151. The 151st word in the Bible is אלהים (Elohim) when the earth brought forth grass, and herb yielding seed, and the tree yielding fruit, and God saw that it was good (Gen 1:12). The 77th prime number is 389. The 389th word in the Bible is העץ ("tree") when God said, Behold, I have given you every herb bearing seed which is upon the face of all the earth, and every tree (Gen 1:29). The 775th Hebrew word in the Bible is האשה (ha-Ishshah, meaning "the woman") when the serpent said unto the woman, Yea, hath God said, Ye shall not eat of every tree of the garden? (Gen 3:1). The 1060th word in the Bible is יהוה (YHWH) when the LORD God said, Lo, the man has (eaten of the tree and) become as one of us, to know good and evil: (Gen 3:22). When Adam and Eve hid themselves in the garden, the LORD God called to "him" (לו) with the word איכה ("Where art thou?"). The words לו and איכה each have a gematria value of 36. After Adam lamely deflected the blame (Gen 3:12), God also questioned Eve (Gen 3:13). Gen 3:13 is the 69th verse in the Bible. There are 937 words in these first 69 verses. The first occurrence of 2755 in pi begins from position 1,515. God sent the man forth from the garden of Eden, concerned that he may also eat of the tree of life, and live for ever (Gen 3:22-23). The phrase "and take also of the tree of life, and eat, and live" (ולקח גם מעץ החיים ואכל וחי) has a gematria value of 541. There are 347 words in chapter 3 of Genesis, and the first occurrence of 347 in pi begins from position 1,092 (see above). The 1,092nd Hebrew word in the Bible is ויגרש ("he drove out") when God drove out the man, and placed Cherubims, and a flaming sword at the east of the garden which turned every way. (Gen 3:24). The word "sword" appears 424 times in the Bible (KJV), a number which is non-trivially palindromic, so it reads the same turned east or west. Beginning from position 1,109 in e are the three digits 555. Beginning from position 1,109 in phi are the four digits 4949, the gematria value of 1 Sa 16:3. Jesse is the father of David. This verse has 14 Hebrew words consisting of a total of 52 letters. The words בן דוד ("the son of David") have gematria values of 52 and 14 respectively. Left Panel of The Last Judgment triptych by Hieronymus Bosch, created after 1482. God is shown at the top, seated in Heaven while the Rebel Angels are cast out. At the foot of the panel, God creates Eve from the rib of Adam. In the midground Eve is tempted by the Serpent, while the couple are finally seen being chased by the sword-wielding Angel into the dark forest. The following three digits are 117. The 117th word in the Bible is אלהים (Elohim) when God said, Let the earth bring forth grass, the herb yielding seed, and the fruit tree yielding fruit after his kind (Gen 1:11). The "pi verse" in Genesis has a gematria value of 5365 (Gen 3:14). The first occurrence of 5365 in pi is followed by the three digits 349. 5365 begins from position 9,010. The name of the prophet Malachi means "My messenger". Malachi (מלאכי) has a gematria value of 101, which is the 26th prime number. Speaking of the coming day, the Book of Malachi says "Behold, I will send my messenger, and he shall prepare the way before me:"
The phrase "But unto you that fear my name shall the Sun of righteousness arise with healing in his wings;" (וזרחה לכם יראי שמי שמש צדקה ומרפא בכנפיה) has a gematria value of 2220. The previous three digits are 367, and before that another 367. The first occurrence of 2220 in pi begins from position 9,334. 343 is the gematria value of ויאמר אלהים ("And God said"), which appears ﻿26 times﻿ in the Tanakh. This first occurrence of 3108 begins from position 11,600. Gen 1:3 has 23 Hebrew letters. The phrase "and there was light" (ויהי אור) has a gematria value of 238. 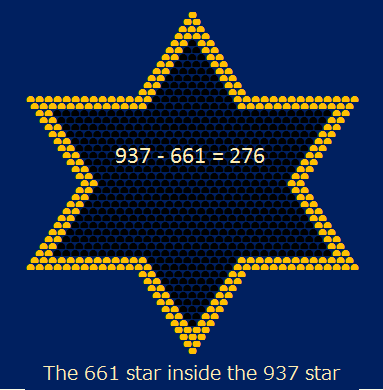 The relevant starting positions are 16 and 23.
the three digits 832, the gematria value of ארץ ישראל (Eretz Yisrael, meaning "the land of Israel"). The 9th star inside the 12th star. The area shaded red = 360. The 11th star inside the 13th star. The area shaded yellow = 276. The preceding two digits are 39, the gematria value of יהוה אחד ("one LORD"). 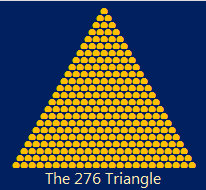 276: the 23rd triangle number. This verse has a gematria value of 5252. The first occurrence of 5252 in pi begins from position 2424. Strongs G2424 is ιησους (Iēsous, translated as "Jesus"). The phrase "two hundred threescore and sixteen" (διακοσιαι εβδομηκονταεξ) has a gematria value of 961. The first occurrence of 961 in pi is preceded by the three digits 555. The 9th star inside the 13th star. The area shaded yellow = 504. The 39th star is 153 rows deep, the same as the number of fish caught in the net at the third appearance of the resurrected Jesus (Joh 21:11). The first occurrence of 8893 in pi begins from position 13,243. This first occurrence of 3901 begins from position 12,222. This is the gematria value of a Bible verse in which John the Baptist began his invective against Pharisees and Sadducees, warning that being an ancestor of Abraham was not sufficient to escape the wrath to come (God's final judgement). The term "flee from the wrath to come" (φυγειν απο της μελλουσης οργης) has a gematria value of 2991. This is the gematria value of the first verse wherein יהוה (YHWH) said הנני (hineni, here translated as "behold, it is I") also see Isa 58:9; 65:1. The first occurrence of 78661 in pi is preceded by the three digits 888. The first occurrence of 3901 in e is preceded by the three digits 555. The preceding four digits are 1117. The 78th psalm is also the second-longest. It is addressed to the people, rather than God: "Give ear, O my people...". In Hebrew, the word "salvation" is ישועה (Yeshuah) Strongs H3444. This word appears 7 times in the Tanakh. The word יהוה (YHWH, translated in the KJV as "LORD") has a gematria value of 26. 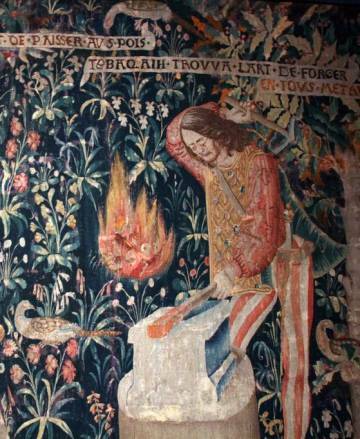 French tapestry (detail), early 16th century, depicting the biblical figure Tubalcain, inventor of the art of iron-working. Musée national du Moyen Âge, Paris. The previous three digits are 344. The name Tubalcain appears twice in the Bible, and the first of these is preceded by the untranslated את (eth), the aleph tav often used used to point out more definitely the object of a verb or preposition. In Hebrew, Tubalcain is two words תובל-קין (Tuwbal Qayin) Strongs H8423. The phrase "The words of the LORD are pure words:" (אמרות יהוה אמרות טהרות) has a gematria value of 1940. The first occurrence of 1940 in pi is preceded by the three digits 543, the gematria value of אהיה אשר אהיה ("I AM THAT I AM"), Gods response to Moses' question (Exo 3:14). The phrase "as silver tried in a furnace of earth" (כסף צרוף בעליל לארץ) has a gematria value of 999. This silver is purified seven times. The words of the LORD are pure words. The word יהוה (YHWH, translated as "LORD") appears 6007 times in the Tanakh (Leningrad Codex). The terms "gold and silver" and "silver and gold" appear 21 and 29 times respectively in the Bible (KJV), giving a total of 50. The gematria value of יהוה (YHWH, translated as "LORD") is 26. The term "And God said" begins 26 verses in the Bible (KJV). In the Tanakh, the term ויאמר אלהים ("And God said") appears a total of 26 times. The gematria value of יהוה (YHWH, translated as "LORD") is 26. The first 3 occurrences of 26 in pi begin from position 6, 21 and 275. The words "gold", "silver", "brass" and "iron" appear in the Bible 420, 317, 126 and 101 times respectively (KJV). In the Book of Ecclesiastes, the Preacher (Koheleth) laments that earthly riches give no enduring satisfaction (Ecc 2:8-11). All they lead to, by his account, is vanity and vexation of spirit. Now Tubalcain was an instructor in brass and iron (Gen 4:22). This is Ecclesiastes' 216th verse, and the phrase "Vanity of vanities, all is vanity", in Hebrew הבל הבלים הכל הבל (Hebel Hebelim, Hekel Hebel) has a gematria value of 216. The word Hebel (translated as "vanity", or "futility") is the key theme, and the most frequent term in Ecclesiastes (38 occurrences). 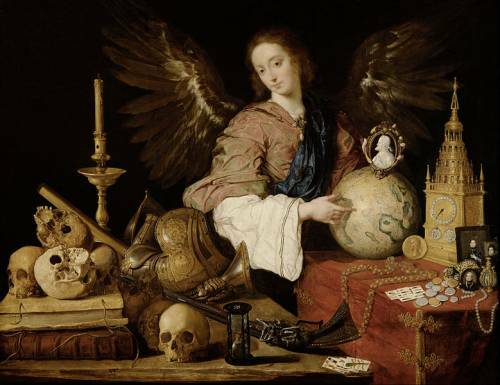 Allegory of Vanity by Antonio de Parida (1611 - 1678). Kunsthistorisches Museum, Vienna. The artist was born in the same year the KJV was first published. In the Aramaic section of the Book of Daniel (Chapters 2-7) the word פרזל (parzel, meaning "iron") appears in 7 verses. Its gematria value is 317.
this verse consists of 33 Hebrew letters. The 7th star inside the 10th star. The totient of 888 (Jesus) is 288. 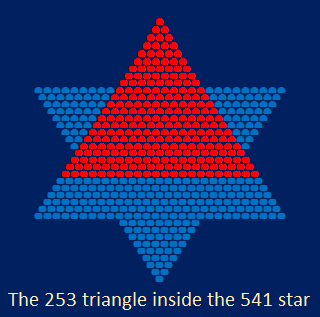 253 is the 7th star and 22nd triangle number. The next six rows to complete the full triangle sum to 153, the number of fish caught in the net (Joh 21:11). The six rows that form a base for the 253 triangle sum to 153, the number of fish caught in the net (Joh 21:11). In Hebrew, the word החרם (haCherem, meaning "the net") Strongs H2764 has a gematria value of 253. Strongs H2764 is also translated as "accursed thing" or "curse", and it is in this guise it appears as the last word in the Tanakh (Mal 4:6). In the Greek, the word δικτυον ("the net") has a gematria value of 854. Beginning from position 854 in pi are the four digits 1000 (one thousand). The word "Melchisedec" has a gematria value of 919, and appears 9 times in the Bible (KJV). Heb 7:21 quotes Psa 110:4 in saying the Lord (κυριος) sware, Thou art a priest for ever after the order of Melchisedec. Melchizedek was a priest of the most high God, עליון (Elyon) which has a gematria value of 166. Beginning from position 983 in pi are the three digits 111, the gematria value of אלף (eleph, meaning "thousand"). The word "thousand" appears in 395 Bible verses (KJV). This is the gematria value of השמים (haShamayim, meaning "the heaven"). The first occurrence of 395 in pi begins from position 532. 253 is the second triangular star number. There are only five such numbers below 358 billion. All star numbers have digital roots of 1 or 4, but all triangular star numbers have a digital root of 1. For example 2 + 5 + 3 = 10, and 1 + 0 = 1. The first few triangular star numbers are 1, 253, 49141 and 9533161. 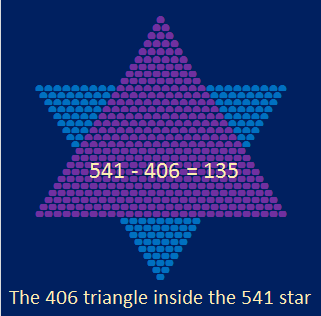 The third triangular star number is 49141. The first three star numbers (1, 13 and 37) have digital roots of 1, 4 and 1 respectively. The preceding five digits are 153 and 17. את is the most frequently used word in the Tanakh, appearing a total of 7,372 times. 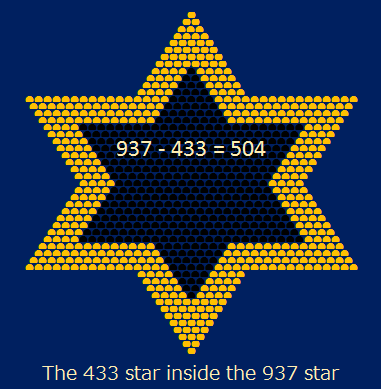 From a purely biblical perspective, far the most important star number is 541, the "Star of Israel". Beginning from position 541 in pi are the five digits 19070. 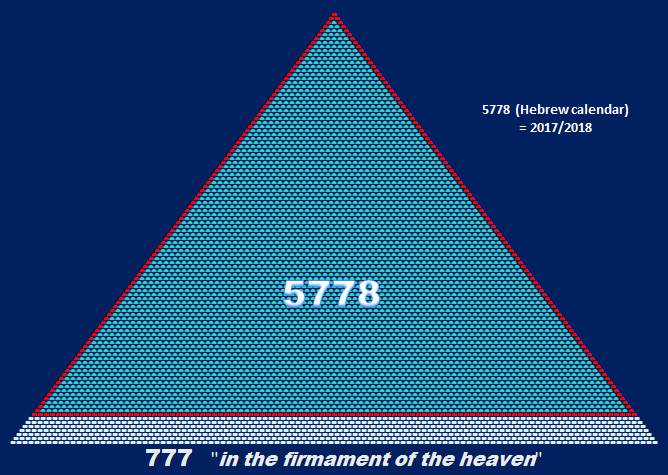 The year 5778 on the Hebrew calendar coincides with 2017/2018 on the more familiar Gregorian calendar. 777 adds 7 rows to the 5778 triangle. The Torah was given at Mt Sinai in the year 2448 on the Hebrew calendar. The preceding three digits are 336. The string 30101 begins from position 30,080. The Meeting of Abraham and Melchizedek, Royal Collection Trust / © Her Majesty Queen Elizabeth II 2015. Isabella of Spain commissioned Rubens c. 1625 to design twenty tapestries for the Convent of the Poor Clares in Madrid. 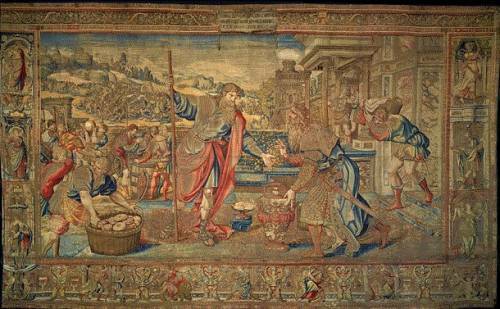 The subject of the tapestry series, woven in Brussels, was The Triumph of the Eucharist. The phrase "the sun and the moon shall be dark" (שמש וירח קדרו) associates Jesus with the king of Jerusalem (Salem). The only reference to Jerusalem in the Torah is in relation to Melchizedek, the priest of the most high God (Elyon) see Gen 14:18. Melchizedek was the priest of the most high God (Elyon). The first occurrence of 22322 in pi begins from position 18,899, which is a prime number. Verse number 18,999 in the Bible (KJV) is the only Bible verse in which the word הנני (hineni) appears twice. In the Torah, the first 115 verses have 1571 words. The first occurrence of 935 in pi is followed by the three digits 112, the gematria value of יהוה אלהים (YHWH Elohim, translated as "LORD God" in the KJV). "From the time of creation constant reference is made in Holy Writ to Messiah and the Messianic hope of Israel. 'And the Spirit of God moved upon the face of the waters' (Gen 1:2); the Spirit of God means Messiah." Gen. Rabba 2; also Levit. Rabba 14. The gematria value of Ιησους ("Jesus") is 888.